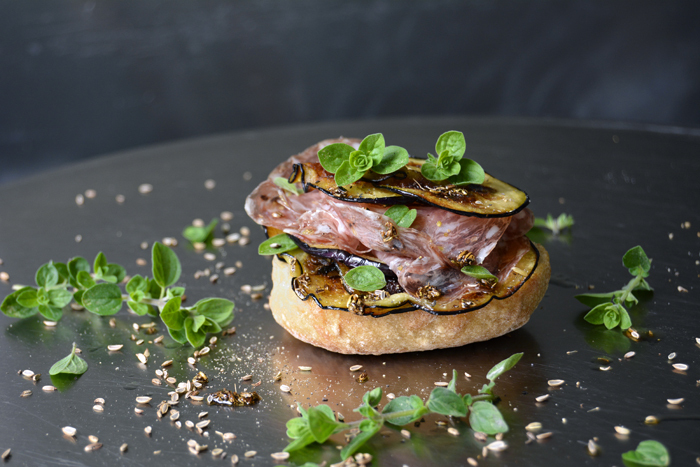 It happened at one of our traditional Sunday pizza nights, we had the glorious idea to drizzle fennel oil over our cheesy salami, aubergine composition and the result was even better than we had expected. I had bought a rather simple salami for this cosy sofa dinner, it was organic but without the addition of any outstanding herbs or spices, just the pure, distinct flavour of the dried sausage. So we started playing around with the ingredients, as every Sunday when it comes to topping our pizza. I cut an eggplant into very thin slices and took out the sauce pan to warm up a splash of olive oil with a teaspoon of my Maltese fennel seeds, Buzbiez in Maltese. I bought them last summer from a lady at the market in Marsaxlokk. Soon, the jar will get refilled when we go back to our Mediterranean island in a month, just the thought of it puts a big smile on my face! Back to the oil, I let the spice spread its aroma on the heat until the seeds started sizzling, it’s important to watch them as they shouldn’t get dark, when they burn, they taste bitter. When I ate the first bite of the baked pizza I knew that this combination would have to be translated into a sandwich. 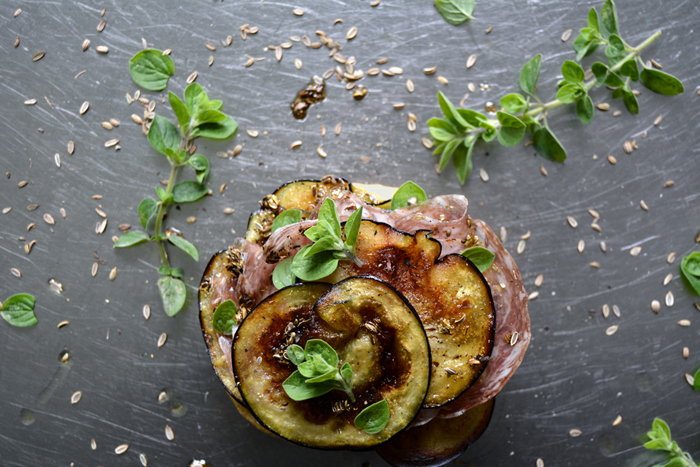 And here it is: thin slices of aubergine sautéed in a pan, topped with Italian salami and sprinkled with fennel oil and fresh oregano. Wonderful! 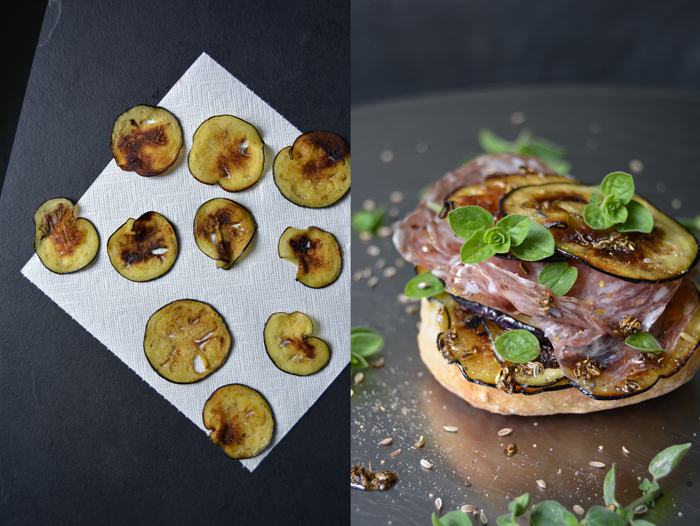 Heat a generous splash of olive oil in a heavy pan and sauté the sliced aubergine in batches on medium heat until golden brown on both sides. Spread them evenly, they shouldn’t lay on top of each other. Mind that you’ll have to add some more olive oil when you turn them around and watch them well as they can burn within seconds. Lay on kitchen paper to remove excess oil, season with salt and pepper and set them aside when they’re done. In a sauce pan, heat 3 tablespoons of olive oil with the fennel seeds. Take the pan off the heat as soon as the seeds start sizzling and mind that they don’t burn. 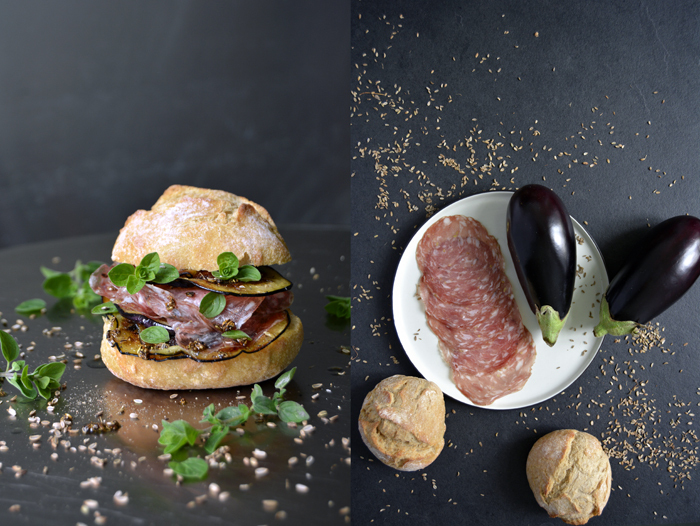 Brush the bottom side of a bun with the infused oil, lay about 6 slices of sautéed aubergine on top and continue with about 3-4 slices of salami. 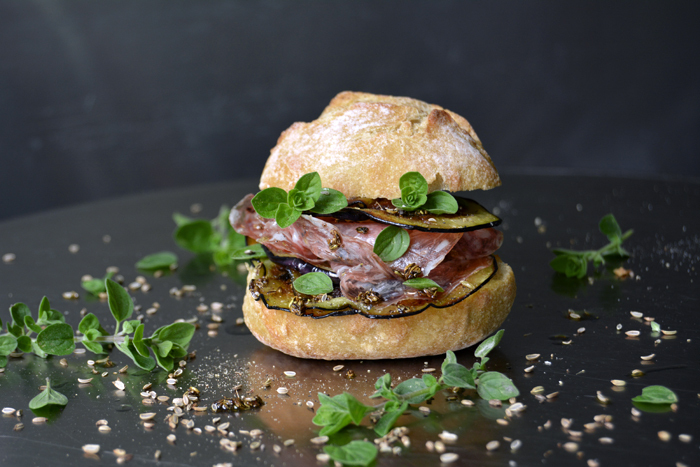 Sprinkle with the roasted fennel seeds and a little of the oil, finish it off with the fresh oregano leaves and close the bun. Enjoy! i smiled when reading about how you both play around with pizza topping ingredients every sunday. 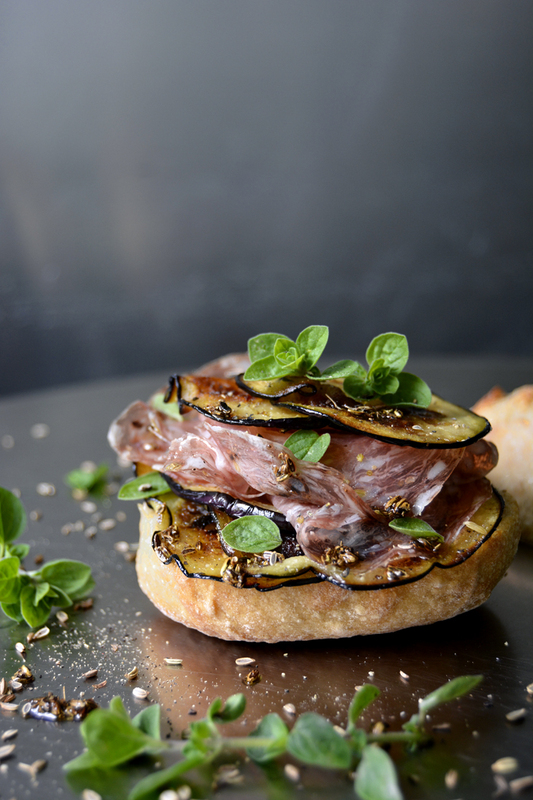 sweet 🙂 meike, i am finding this buzbiez oil-sauteed eggplant, salami, and fresh oregano idea pulling my mind in so many directions. i happened upon some beautiful eggplant yesterday and still have two left. i will pick up some salami tomorrow. yum yum yum! p.s. word of the day = buzbiez… googled. noted. happy. 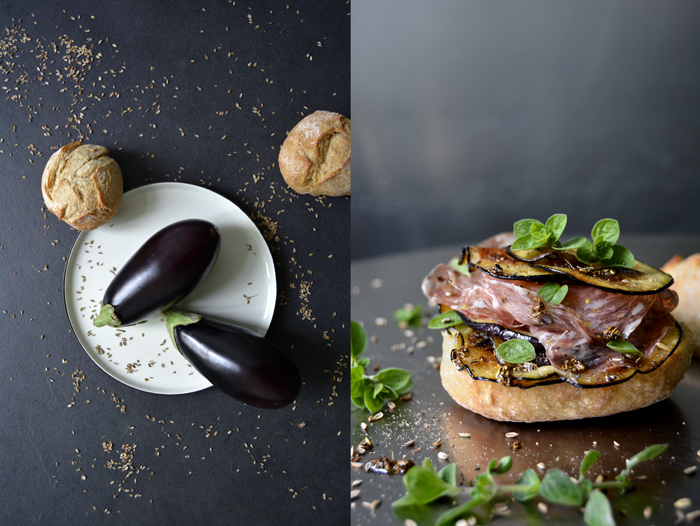 Oh I love our Sunday pizza tradition, so much so that I always try to avoid dinner invitations on Sundays 🙂 I’m a big fan of buzbiez oil in general, but it’s simply amazing in combination with juicy eggplant. Again, I’m so glad you enjoy the inspiration! Bon appétit!